While still relatively expensive and primarily aimed at creative professionals and enthusiast gamers – 4K monitors are becoming more common and affordable – with some costing less than £300/$400. Faster computers, new display ports and cheaper monitors makes the upgrade to 4k easier than it’s ever been. 4K, as many of you will already know, is the next big jump in display resolution for our TVs, monitors and probably even our phones and tablets in a year or two. Also known as Ultra-High Definition (UHD), 4K delivers four times as much detail as a standard 1080p (or full HD) picture. So where full HD delivers 2 million pixels – 4K delivers 8 million pixels and it’s those extra pixels that make everything crystal clear and super sharp. It’s also worth mentioning that technically there are two kinds of ‘4K’ – cinema and consumer. The difference is the 4K digital cinema standard shows images at a 4096 x 2160 resolution whereas the consumer UHD format has an ever-so-slightly lower 3840 x 2160 resolution. This isn’t a big deal for TVs as they pretty much all use the lower consumer standard – however for monitors, although most do use the consumer standard, you can buy professional cinema standard monitors too – for example the LG 31Mu97 has the full 4096 x 2160 resolution. So it’s worth taking a look at the resolution in the specs if you are looking to purchase a new 4k monitor. The reason phones, TVs and monitors keep increasing resolution from HD to Full HD and beyond is to simply provide a clearer and sharper picture. This ultra-high level of definition and clarity can be invaluable for photo and video editors or gamers seeking the highest possible visual fidelity. If you record 4K video for example, which even some smartphones can do now, you’ll need a 4K or – even 5K, but we’ll talk about that later – monitor to view and edit the content natively. Popular PC games like Grand Theft Auto 5 and The Witcher 3: Wild Hunt have been optimised for 4K resolutions too, with higher quality textures and graphics making the game look better. 4K monitors also allow you to be more productive and help with multitasking. More pixels means icons and applications are relatively smaller on the screen and therefore you have more space or ‘desktop real estate’ to play with. So if you’re a big multitasker who likes to have loads of apps and windows open at once – the extra space you get can be extremely valuable. So whether you’re a gamer, multitasker, photo and video editor or someone looking to watch 4K YouTube videos or stream House or Cards and Breaking Bad on Netflix – there are plenty of reasons to invest in a 4K monitor. Pushing the 83 million pixels on a typical 16:9 4k Monitor requires a significant amount of horsepower, especially if you intend to run modern games or graphically intensive applications. Although technically you can run a 4k monitor using the integrated graphics on AMD’s Trinity or Intel’s Ivy Bridge processors found in desktop PC’s and laptops – it’s far from recommended as they simply lack the power and display connections to provide an enjoyable and productive 4k experience. Intel boast their NUC (Next Unit of Computing) range of Mini-PC’s that feature Haswell processors can output 4k resolution. However not all Haswell processors can handle 4K at the same frame rate. Low-power (or ‘U-class’) processors like the Core i5-4200U commonly found in Ultrabook’s and Intel’s i5 NUC are limited to 30Hz over DisplayPort and 24Hz over HDMI, while more powerful M-class processors like the i7-4700MQ or full desktop chips like the i5-4670k can output 4k at a more comfortable 60Hz. So this is all getting a bit complicated. Put simply, it’s recommended you have at least a Haswell i5 processor with its integrated graphics chip (avoiding the U-class if possible) or a dedicated graphics card. Nvidia provide a list of supported cards, from the Nvidia 660Ti all the way up to the GeForce Titan X – depending on your budget. If you are using a dedicated graphics card, a safe rule of thumb is if your Nvidia or AMD graphics card is a 2013 or later model it will be absolutely fine and support 4k. Unless your monitor boasts a HDMI 2.0 port which is fairly rare except for a few of the latest 2015 models like the Viewsonic VP2780-4K, it’s a good bet that it will have either a HDMI 1.4, DisplayPort 1.2 or both. There are numerous technical differences between them but the important thing to know is that HDMI 1.4 can only output 4k at 30Hz (which means 30 frames per second) which is comparatively low and will make your desktop experience less fluid. DisplayPort 1.2 however can output 4k at 60Hz (60 FPS) which is much more pleasant to use and typical of most modern monitors (except for 120/144 Hz gaming monitors). For a better 4k experience then, before buying a 4k monitor check to see if both your computer and the monitor feature a DisplayPort or HDMI 2.0. The biggest downside to using a 4K monitor is its impact on the frame rate of games and applications. Even if you have a compatible processor, graphics card and use the optimal display connectors, you need to be aware that as with any increase in resolution, there will be a corresponding drop in frame rate. If you are a gamer, even the latest 2015 graphics cards like the 980Ti or R9 Fury X only just manage to maintain a playable average of 30FPS in modern games. Of course you can always lower the graphical settings to improve the frame rate – however I would presume if you are investing in a 4K monitor, graphical quality is important to you so lowering options would be less than ideal. Alternatively you could consider a multi-GPU setup in the form of Nvidia SLI or AMD Crossfire to theoretically double the frame rate to a more fluid 60 fps, although this would require serious investment in the region of ~£1000/$1500 for two high-end graphics cards. It’s at this point, if you’re a serious gamer, you might want to reconsider buying a 4k monitor and opt for a less demanding 1440p option. It’s important therefore to consider whether your computer will be able to handle the performance hit of upgrading to 4k. 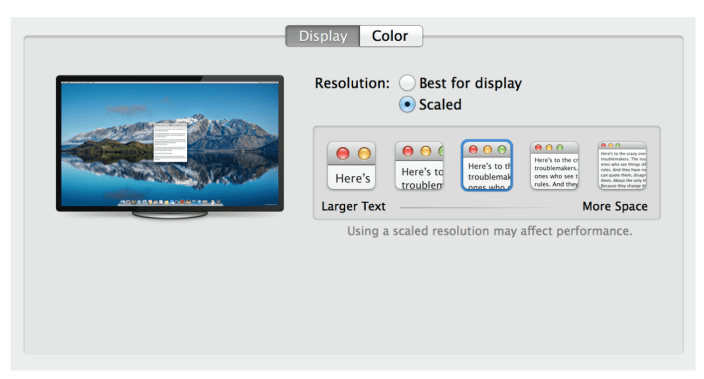 4K can make icons, text and applications look incredibly small making them hard to click and potentially causing eye-strain – so I would avoid 4K monitors smaller than 27-inches to mitigate this issue. It’s also highly recommended to run the latest Windows (8.1/10) or Mac OS (OS X Yosemite) to take advantage of the best scaling software so you can tailor the size of apps and icons to suit you. The old adage of “You get what you pay for” holds true when it comes to monitors. Comparatively cheap 4K monitors often suffer from outdated display connections, low refresh rates and poor image quality as a result of using cheaper panels. For example the Dell P2815Q can be found on Amazon for around £250/$440. This 28-inch Dell uses a cheaper TN (Twisted-Nematic) display panel which although fairly common, doesn’t match the superior colour accuracy and viewing angles of higher-quality IPS (In-Plane Switching) or PLS (Plane-to-Line Switching) panels. TN panels are perfectly serviceable and a solid option if you’re in the market for a budget 4K monitor, however the bigger issue is the refresh rate. The problem with many low-cost or early-model 4K monitors is they have maximum refresh rate of 30 Hz, which is around half the rate of a typical monitor. This makes everything from moving the mouse to opening applications feel jerky and unpleasant. I strongly recommend avoiding monitors that do not support 60 Hz refresh rates and do not feature a DisplayPort 1.2 or HDMI 2.0 port, essential as we discussed earlier for delivering the higher rate. If you are editing 4K video, the toolbars and menus of the software you use such as Adobe Premiere Pro or Final Cut Pro will take up a significant amount of space – or pixels – on the screen. In order to edit the 4K video in its native resolution and original size, without needing to pan and zoom around, you can compensate for the software by investing in a 5K, or 5120 x 2880 resolution monitor. 5K monitors, like the 27-inch iMac with Retina 5K display are aimed at more serious creative professionals, those who need to edit 4K footage natively and of course those who want pixel bragging rights. 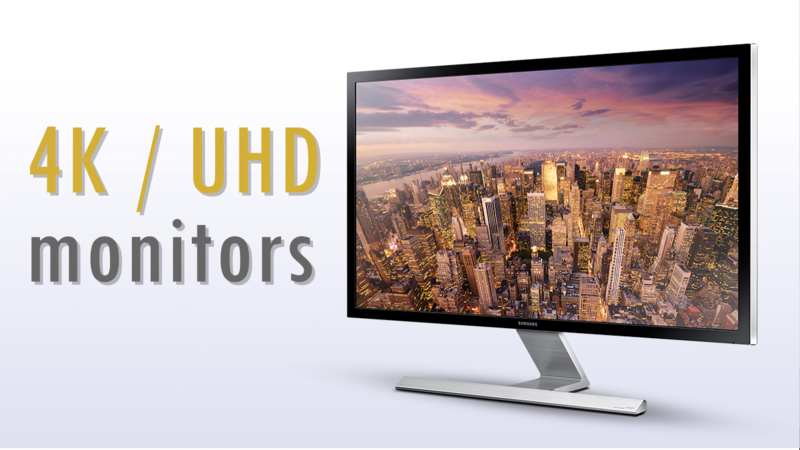 I hope you have found this guide to 4K monitors helpful – if you have any thoughts or ideas please leave them in the comments below. Don’t forget to subscribe to my YouTube channel and follow me @thetechchap on Twitter to keep up with all of the latest tech news and reviews.